DMV.com provides Ohio Bureau of Motor Vehicles drivers with all the information that they need regarding OH DMV-related services. Our experts have assembled all of the material necessary to complete Ohio DMV transactions, such as obtaining your first driver’s license, renewing an expired driver license and applying for a driving license replacement. Visiting the DMV in Ohio will be a less overwhelming task with the information you obtain through our website. DMV.com also assists drivers by providing valuable OH BMV information on properly owning a vehicle within the state, such as details on how to apply for a car registration renewal. Furthermore, you can get a copy of your OH DMV driving history, your vehicle history report and more via our online services. For more detailed information on the Ohio Department of Motor Vehicles resources available at DMV.com, continue reading the sections below. Learn how to get a drivers license in Ohio easily. OH residents must obtain a drivers license from the BMV before they can drive legally. Order Ohio driving records online quickly and conveniently. You can obtain your DMV driving history without having to wait at the DMV. Get car insurance in Ohio for less through our online auto insurance center. The BMV requires auto insurance for all Ohio motorists. Completing an Ohio traffic school course can allow motorists to obtain a lower insurance premium. Discover OH DMV traffic school benefits. Take an Ohio DMV practice test to gauge your driving knowledge. Completing an OH DMV practice exam helps you prepare for the license test. Learn how to get Ohio car registration documents, renew registrations and more. 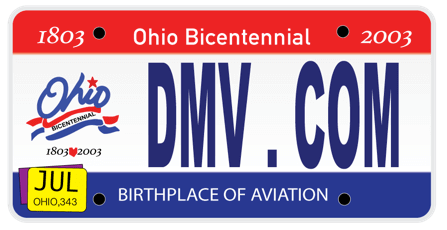 The BMV requires motor vehicle registration for Ohio cars. Ohio drivers ed is a BMV requirement for license applicants younger than 18. Take Ohio online drivers ed for the best experience. An Ohio bill of sale document confirms ownership after you buy or sell a car. Find out how to obtain this car sales receipt from the OH BMV. Learn how to pay a ticket online and how to fight speeding tickets in OH. Unpaid Ohio traffic tickets result in DMV penalties. A first DUI in Ohio results in automatic license suspension. Learn more about OH DUI laws and DUI penalties imposed by the BMV. Before you buy a car in Ohio, consult our resources. Learn how buying a car online can simplify your BMV new car registration process. Find Ohio DMV locations and hours quickly and conveniently. OH DMV locations in your area let you obtain the DMV services you require. Cut out BMV’s bureaucracy. DMV.com has easy guides for drivers license, vehicle registration, license plate, emissions and other motor vehicle issues online. Ohio residents don’t have to deal with the BMV’s bureaucracy any more. The DMV.com presents you the best guide to the Ohio Bureau of Motor Vehicles, where you can find all the details you need to know about the Ohio BMV in no time. Our website functions independently as it is not affiliated with any government agency. It’s mission is to help people save time and hassle when dealing with driving/dmv issues. We provide our readers with easy to understand how-to articles, helpful guides and tools regarding vehicle registration, driver’s licensing, auto insurance for your car, motorcycle or boat. Just check out our articles. All the state’s requirements on getting your driver’s license can be found here. To navigate around the guide use the “search” feature or the navigation sections to help you find exactly what you are looking for. Our readers can also lend us a hand as well. You can contribute by commenting or asking questions. Help us and we will help you by offering the most up-to-date information on the Ohio BMV. Last but not least, don’t forget to check our Facebook page.